Amy has worked in the Wedding and Event Industry professionally for over 6 years creating memorable weddings and special events. Amy’s fluency in weddings and events helps to translate and articulate a couple’s vision into a real life fairytale, for a truly stylish and distinctive occasion. She has always been passionate about wedding and event planning. Her career began in Houston in 2009, working in a fast paced, time critical environment that demanded exceptional planning and organizational skills. With experience under her belt, she was able to build a vast network of wedding industry contacts, always gaining ideas and valuable knowledge in all aspects of the planning process. Over the years, she has developed a craft to create an event planning experience that is not only smooth, but organized and thorough for couples. It’s her goal to lighten the load, while at the same time, create an event that is just “so you!” She believes the best compliment a couple can receive after their wedding is that their event was a direct reflection of their love for each other and their personalities! 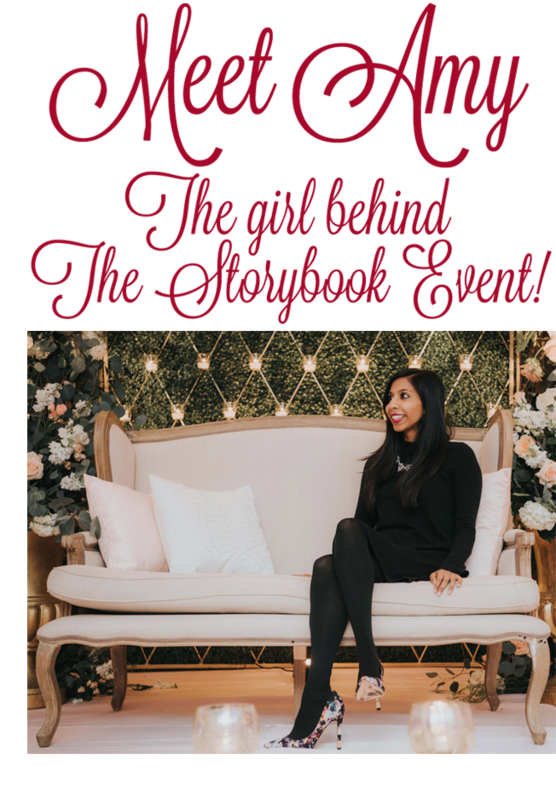 As the owner and founder of The Storybook Event, Amy Patel is dedicated to continuously showing you how to manage event planning, offering you our knowledge and experience on every single detail. She strongly believes with a little creativity and fun, our team can help carry out the most remarkable and unique experiences. With access to professional and highly rated vendors to outlining the event day itinerary, we ensure a beautiful, romantic, and epic event awaits you and your gracious guests. We enjoy sharing your love story in our Storybook. “Let me begin by saying, AMY IS THE BEST! I’ve known Amy since college and when she stepped into the wedding planning industry, I always told her she’d be my wedding planner! Haha! And that day finally came. “I was referred to Amy by a few friends that used her services. They had nothing but high praise for her so the decision was easy. From the moment we booked Amy’s services, she wasted no time working to make our dreams come to reality. She started contacting venues, vendors, etc. She created detailed spreadsheets and kept us on track with our budget. She attended vendor meetings in our place when we were unable to go. As we got closer to the date, she created monthly to-do lists which contained items we would have otherwise overlooked. This is only to name a few items she did for us in the planning phase. There was much more. During our wedding week, she took it upon herself to complete certain tasks which was a HUGE help. She made sure were always well fed and taken care of all while making sure the events ran smoothly. She was always available for anything we needed. She is the reason we actually got to enjoy our wedding! I cannot tell you how many people have asked me for her contact information after our wedding. Our wedding was absolutely beautiful and way more than what we expected. It’s been a little over a month and the compliments are still pouring in! Amy went above and beyond to help our vision come to reality. She has a lot of clients but somehow she makes you feel like you’re the only one. Her attention to detail, professionalism, and sweetness is what makes her clients feel completely at ease. If you are thinking about booking Amy’s services let me make the decision easy for you… DO IT! “John and I reached out to Amy and a few other planners before we even had a wedding date – Amy was no doubt the best choice. At our introductory meeting Amy already had a plan for us on the table! Selling point right there. Amy was professional, positive, and carried with her a “can do” attitude. Throughout our planning process, she was organized, had commendable attention to detail, and was knowledgable. I have so much respect for the fact that she cared and treated us like we were the only couple she was planning a wedding for. With timelines, monthly to-do lists, prompt email and text responses, and most importantly, reputable and trustworthy vendors under her belt, Amy made our wedding planning experience so much more easier than it probably would have been without her. On the day of the wedding, she helped keep the whole event organized and even graciously help us and our families with a lot of little tasks. Yes, the little things matter. Even after our event she coordinated pack up and responsibly handed over our items to appointed family members. “Our wedding could not have been so wonderful and elegant without Amy’s help. Amy is the best in the business and we knew that we were in the best hands from day one. Planning a wedding while working full time would have been impossible for us without her. Right off the bat she organized meetings with vendors and worked around our busy schedules. She created a detailed event timeline to help keep us on track and not leave things to the last minute. Amy was easily approachable and quick to respond via phone and email. We were very appreciative of that. The toughest part of planning our wedding was ensuring each vendor would not loose track of our ultimate vision of our day. Armed with Amy’s attention to detail and organizational skills, she ensured our vision was never comprised all the while staying within our budget. During our wedding week, Amy made sure that we were relaxed and taken care of throughout all the events. She would grab us food and kept us comfortable. The events started on time and went smoothly according to our original timeline. Till this day we still get compliments from family and friends that our wedding was the best they’ve attended. We always tell them that Amy made it all possible and memorable for us. Amy’s mindful and thoughtful nature kept us feeling truly special through our series of events. We like to think of Amy as a ‘Maestro’ coordinating the most elegant symphony, ensuring every vendor hit their proper notes at the correct time! You can tell she truly loves what she does. We wouldn’t recommend anyone but Amy to plan other weddings, you definitely won’t be disappointed. She has become part of our family and we will always cherish our relationship with her. Amy went the extra mile every single time to make sure we had an amazing time at our wedding. We will forever be grateful that Amy was our planner! THANK YOU SO MUCH!! “Amy is the definition is of someone who goes above and beyond to do her job well. We planned a Houston wedding from NYC and SF, with only one set of parents in Texas (2 hours away), so having someone like Amy to hold down the fort was essential. But it’s not just Amy’s responsiveness, attention to detail, professionalism, and thorough knowledge of the event-planning process that we were so impressed with. When wedding time rolled around, Amy was our right-hand person and best friend. What was so amazing is that when events started, all we had to do was show up. We could actually breathe easy knowing when we arrived at our events, everything would be in place as it should be. And that’s exactly how things went down. We had a couple of hiccups throughout our event (as expected with a 3-day wedding), but Amy always managed to smooth things out without batting an eyelash. It was the only time during the entire wedding planning process that I could really let go and know Amy had it taken care of. What’s more was how incredibly caring Amy is: Every time we turned around, she had made us plates of food ready to eat for when we could grab a bite in between socializing and made sure she had drinks for us even before we walked in. Throughout the events, she was grabbing us drinks and making sure WE were taken care of—something that my husband and I are so thankful for. This is probably what makes her stand out from all the rest. On the first day of our events, we didn’t hire Amy to be onsite thinking it would be fine because it was just one party in the evening for about 60 people. But when we realized our venue (a hotel we had all our events at) messed up something very simple that was confirmed more than once by Amy and myself on the very first day, Amy took it upon herself to check herself into the hotel and be onsite to make sure everything was executed seamlessly—something we didn’t even ask for! Making sure your event is as perfect as possible is Amy’s personal goal, and we’re so grateful for that we had her on our side. From this point on, we knew Amy had it handled. Trust me, even if you think you don’t need a planner, you do. Do it for your sanity and so you can actually enjoy your wedding. Amy has multiple flexible packages to choose from. We hired Amy to come in after contracts were signed and to handle all the final details, including building timelines, confirming guest counts, sending reminders for final balances—you name it! She even helped mediate calls between parents and our priests, as we were having a multi-cultural wedding, and there were some things that were best explained by a neutral party. “Amy, where do I even begin? The first time I had met you and found out that you were a wedding planner, I kept that in mind for the day I would really need you for my big day. Never thought that time would come soon right after. You had just started with your own company, The Storybook Event, which ironically fit well with our wedding fairytale story. As soon as we finished with our consult with you, I had set my mind to utilize you as our wedding planner. From day one, you kept us on our toes with picking the best wedding vendors that would fit our needs when it came to our theme, budget, and do’s/don’t’s. You helped us in creating a schedule with all aspects of the wedding planning process, which was broken down so that it would not be so overwhelming. You also helped with finalizing all the important details. You kept close attention to what we wanted and did not want, which made the wedding planning experience so much easier. When things didn’t work out for me, you helped turn that back around and make things better. When things got tough with family members getting in the way of making decisions, you helped pushed through to give us what we wanted. You helped us understand what each vendor would want and need to better prepare for the meetings. You helped to keep each event run in a timely manner, which is usually very difficult to do in Indian weddings. You also fed me food, while my mehendi was still drying and while I was hungry! Your professionalism, quality of work, timeliness, sweet and friendly personality, as well as organized and understanding nature helped to create our fairytale wedding into the most beautiful wedding I could have ever imagined for Himanshu and I. My family and their friends, as well as our own friends still praise the beautiful work you did. You are the best wedding planner and I truly am glad I chose you and your team to be a part of our wedding experience. THANK YOU so much from the bottom of our hearts! “Where do I even begin!!? Having Amy and her team working with us throughout the entire wedding planning process was probably the best decision I made! At the start of the planning process, I went through a great deal of confusion about hiring a planner, because of having such a big, helpful family. But, after meeting with Amy and hearing about all of the packages, I knew I would need all the extra help I could get with my big, fat indian wedding! Amy, to US, was not only our planner but also an old friend, which made hiring her an even easier decision. Right off the back, Amy contacted various vendors, provided detailed spreadsheets for us, and gave her own expert opinion on which vendors she had great experience working with. Amy was always just a text or phone call away when we ran into challenges, and consistently held a positive spirit throughout the process. Her professionalism and speedy responses were definitely something we needed during the last few weeks, leading up to the wedding! Timeliness was really important during each of our events and Amy and her team made sure all events ran according to schedule and made adjustments where needed. Amy knew that my growing budget needed to be watched, but provided us with a myriad of options to save where we could.